Cool marketing. Squeezing the extra whisky from the oak barrels. And the oak shows for sure. This is a noticeably strong whisky, and on the palate it's oak, oak and more oak. Some vanilla and cherry show up later, but my palate was kind of overwhelmed by the oak. It's a full bodied drink and not for the faint of heart. But it's enjoyable for sure. I don't feel like I have to mix it with coke like the white label. I've been meaning to write about one of my favorite mixing bourbons. I think Jim Beam Devil's Cut is the perfect cocktail bourbon. Is it blasphemous to some to ruin a perfectly good bourbon by adding a splash of coke, sour, or bitters? With Devil's Cut I think not. Much like making a margarita out of tequilla with strong flavors, Devil's Cut reminds the cocktail drinker that they are indeed having a bourbon cocktail. Dilution smooths out the rough edges of this bourbon, but preserves the wood, vanilla, and sweet characteristics that define bourbon as a whole. In a cocktail, Devil's cut holds unholy dominion over its fallen competition. I'll take it over Knob, Jack, Makers, turkey, ect, ect. Devil's cut in my opinion is a necessary addition to every bar. I sip it on ice with a splash of coke and a squeeze of lime. Give the Devil his due. From what little info I can gather online, Jim Beam extracts the “devil’s cut” by soaking a used cask in water. The water, which is thinner than bourbon, can soak quickly into the pores of the barrel, dilute the remaining bourbon that has been trapped within the wood, then extract it. This barrel full of woody whisky water is then used to calm the bourbon down to 45%. The added woodiness is what gives “The Devil’s Cut” its character. Cool idea. Nose: Quite pointed and high-pitched. Vanilla, root beer, pine, oak, licorice, nutmeg, gingerbread, and grapefruit pith. Palate: Very light and watery for a bourbon. Woodspice, butterscotch, cinnamon, Worther’s Originals, oak, and pine. Finish: Big wood, pine, ginger beer, butterscotch, cinnamon, woodspice, allspice, and honey mustard. Watery and short, with lingering drying wood. This is what I’d call a premium mixer. By itself the flavours are solid, but it’s too watery (says the guy who always complains that bourbon is “too thick”). The woodiness does shine here, but the mouthfeel detracts from the sipping experience. As a mixer, the classic bourbon flavours and the added intensity of the wood make this fantastic. My FAVORITE whisky/soda combo is Devil’s Cut with cream soda. Try it, it’s pretty epic. Bourbon producer Jim Beam launched The Devil's Cut in 2012. Just like the angels, the devils arrogates himself a few glasses of the spirit that has been lounging around for some years. The angels claim 2 to 3 percent on an annual basis. The devil hides his share in the cask itself. Unfortunately for him, the people at Jim Beam use a tried and true method to filch him his share. Pour a few liters of water in the "empty" cask and start shaking it. After half an hour you will get a decent ammount of whiskeywater, ready to blend with the actual whiskey. This concludes the marketing story around The Devil's Cut. On to the real deal: the tasting notes. Colour: The devilish sample has a copper colour and does not seem to stick to the glass while swirling. Nose: The nose is sweet. What am I saying? Sickly sweet. The stuff that makes a big-bellied American lick his fingers. Popcorn, vanilla and sweet maize. And yet more sweetness has to arrive. Maple syrup and coconut. Almonds and pine nuts straight from the frying pan. The flavours evolve towards gingerbread, aromatic oak and pine wood. More like pine wood resin. Taste: Your tongue tries to survive a full frontal sugar attack. Nutmeg and vanilla prepare your palate. Then again sweet corn, brown sugar and caramel candy will raise your blood sugar concentration. To finish things off you wash everything away with a can of ginger beer from an Asian supermarket. Just to make sure your Weight Watchers adviser really freaks out. Finish: The aftertaste is being dominated by vanilla, cinnamon, ginger bread and a little bit of mint. Sweet seems to be the buzz word of this review. 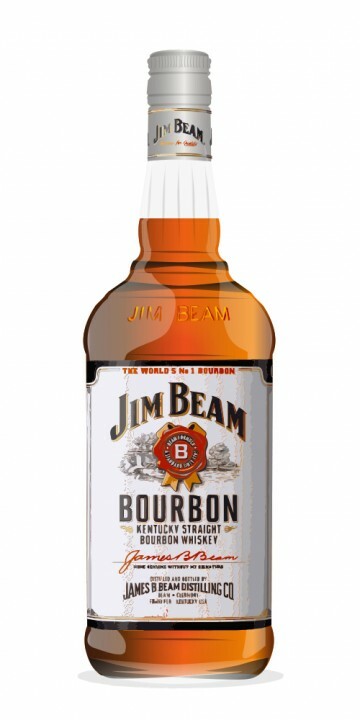 Bourbon has (to me) the reputation of a sweet tooth's drink and this Jim Beam confirms every bit of it. I'd serve it "on the rocks" after a summer barbecue. And you don't have to be afraid your friends will ruin you. It costs € 25. Jim Beam Devil’s Cut is of course a tongue-in-cheek reference to the Angel’s Share, the part that evaporates during maturation. Hence what is left in the cask, according to Beam’s marketing departement, must be the devil’s cut. Nice one. But is it also a good dram? Better than the standard Jim Beam offering? Let us find out. It matured for 6 years. The nose is quite expressive. Some cassonade graeffe (light brown) sugar, quite some vanilla and coconut, mild spices (mostly nutmeg) and a hint of oranges. The attack is light (bordering on weak) and very sweet. Vanilla, honey and butterscotch come first, then some caramel and breakfast cereals. Some roasted almonds. Cinnamon and nutmeg, not much, before a slightly tannic side is revealed. Drying, which is rather fitting, eh? The finish is more of the same, pretty long, on spices and cereals. It is indeed significantly better than the standard Jim Beam bourbon, available for around 30 EUR, which is fair. Goes down very well in a tumbler with a cube of ice. Oh, blasphemy! Wow! What can I say about this wonderful bourbon! First off we all know the story by now. This bourbon is extracted from the wood of the barrel and mixed with extera aged jim beam. Nose: sweet and spicy, (not as much alcohol as I thought there would be) lost of oak and fruit whith a touch of caramel and vanilla. Finish: The finish is wonderful as well. a bit more spice in the finish but still has those awesome fruit, wood and caramel taste mixed in. Balance: This is extreamly complex and one of the best balanced bourbons I have ever tasted! I also got a bottle of Jim Beam Devil's Cut with low expectations (it was on promotion, dirt cheap, so I thought, what the hell!). But I was also bowled over by it's great taste and balance. This is really good stuff. Arrrgh! Should be "its great taste" and not "it's great taste". Jim Beam is the bestselling bourbon brand in the world - and is now owned by Fortune Brands, which also operates Maker's Mark. It started in the 18th century with Jacob Boehm, and the bourbon's namesake was Jacob's great-grandson. The Beam family connection still continues to this day - Booker Noe being Jim's grandson and pioneer of "small batch bourbon." Other Jim Beam brands include Baker's, Booker's, Basil Hayden, Knob Creek, etc. Devil's Cut is actually a great marketing gimmick - playing off of the term "The Angel's Share", Devil's Cut uses the bourbon that has soaked into the oak during aging. Exactly how that is extracted, and how much of that is used, is anyone's guess. But it is fun to contemplate while sipping this interesting (but not quite successful) bourbon. The colour is not as dark as you might think - a medium amber with straw highlights. On the nose, you get a burst of oak - lots of oak - with vanilla, cherry compote, brown sugar and dates, yet at the same time it seems a wee bit thin. Water brings out more of the corn and rye grains, which really adds to it. The palate is again, very oaky - even slightly mouthdrying. Actually, the notes are very much what was apparent on the nose - lots of vanilla, dark fruit, deep brown sugar. Water adds a little cinnamon and cayenne but also thins out the other notes a little, unfortunately. The finish is long and, well, very oaky (are you seeing a theme here?) but it does develop. However, the mouthdrying effects really take hold here, which I find a little unpleasant. Overall, this is an interesting bourbon in that this method has not, to my knowledge, been tried before. But I don't think it quite works as the oaky notes dominate the spirit far too much. It really works in a bourbon and coke, though, giving it an edgy, sharp flavour. Jim Murray rates this relatively high (89) but not once in his notes does he mention oak, which I find bizarre. Unlike you, Jim Murray probably did not work his way through a bottle of Devil's Cut and contemplate all that it had to offer. His whisky bible provides reviews of a thousand whiskies. It is not possible for him to review with the accuracy that you have here. Respectfully, you give him too much credit. Trust your own judgment. PS, very oaky indeed, but for me, in a good way. I have to agree - lots of oak. But I really like it, and, at least in Canada, is my choice for a budget bourbon. The oaky effect, for me, is very enjoyable, and I don't mind the mouth-drying. But I can understnd the roughness of this one being a bit less appealing. Nose: lots of charred wood. Soem sweetness but also something sharp and bitter. Taste: rather rough on its own; ice softens the delivery, bringing out creamy, almost malty flavours. Finish: nothing spectacular. Consistent with the flavour, at least. Balance: not sure if Jim Beam did us any favours by adding the "devil's cut" to their whisky. I seem to remember their black label being quite a bit better than this. Not bad, not great. The bitterness throws it off somewhat. Fred Noe, master distiller at Jim Beam, states that Beam's very recently released Devil's Cut bourbon is a 45% ABV blend of Beam standard mashbill 6 year old bourbon with "barrel-treated extract" bourbon, i.e. the bourbon 'dregs' which had remained trapped in the barrel wood after the barrel had been dumped. Beam gives no details on its proprietary extraction process. Nose: very oaky, like 15-25 year old bourbon, sweet, lots of caramel and vanilla, as you would expect, a hint of lemon and orange. This is a very pleasant nose for lovers of the wood flavours. Taste: like the nose, the palate also tastes like a bourbon aged long in the wood, 15+ years. The body still seems medium to me, but there is a noticeably oily quality that seems to present a lot more than I would expect to encounter in a 6 yo Beam product. Along with the strong wood flavours present in the nose, I do very definitely taste some sweet orange on the palate. The alcohol content is very noticeable here, but not overbearing. This product tastes quite different from Beam White Label, Beam 7 yo White Label, and Beam Black Label. The palate is pleasant, though definitely not refined. The wood adds a lot more bass notes to the flavour here than are present in the Beam White Label versions. Rough and tumble. Finish: Long finish with the flavours staying quite strongly til the end. Once again, fairly pleasant, though not refined. Balance: Good job, Fred, and Beam! This is the poor man's 20 year old bourbon. While the USA price point for this whiskey is about $ 25, this whiskey has taste features that would almost never be found in whiskies costing less than twice that amount. On its own, this works pretty well. It is certainly not the connoisseur's choice for refined bourbon, but more like the winemaker's marc, that he enjoys in a hearty way as the side-effect of his major efforts. Among the Beam products I would probably turn to this one only occasionally, but it is fun, and grows on you with repeated acquaintance. Tried this at Disney Party of the Senses (Jim Beam booth with Knob Creek and Laphroaig). I like how you took it to a new level on how the "cut" added years to the product...I didn't find it to be worthy of its price spread above the rest of their line, but it was fun. @darktrader, yes, looking at price versus value, I would much rather drink Jim Beam Black Label than the Devil's cut, which is actually a little more expensive here than the Black Label.